Gathering Together has had a rich association with Dr. Chris Hena, the founder of Waterfield Primary Health Center. She has been a change agent in the surrounding communities, especially reaching out to women. Through other partners around the globe, we have helped to provide a roof on the new health center as well as provide for the “Gathering Together Waiting Room” – a nice use of our name – we hope as patients are Gathered Together in the new waiting room they are one step closer to better health. Not only can patients receive physical healing at Waterfield Primary Health Center, but now, thanks to a playground donated by Gathering Together, emotional healing through the joy of play can also begin. 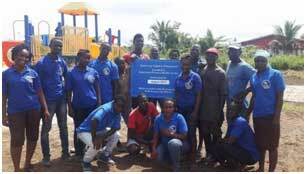 The sons of 2 GT Board members started a playground project in Liberia in 2013 when they were 10 years old. 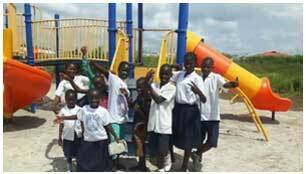 Their goal is to get 1 playground in each of the 15 counties in Liberia. Because we have such an amazing relationship with Dr. Hena and her staff, we could see the benefit of getting her a playground as well. 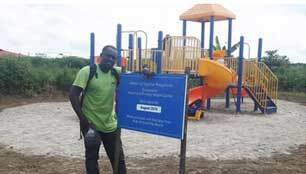 So now Margibi County is very fortunate to have 2 modern playgrounds for children to play at. We are so thankful for our friend Caleb Mensah, our good friend from Ghana. Caleb helps us organize logistics and other things when Gathering Together is working in Ghana. But Caleb has also come over to Liberia to build 3 out of 4 of the playgrounds here. He is a joy to be around, even when they are building in pouring rain. 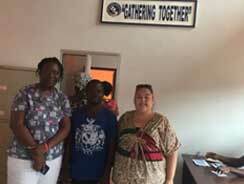 We can feel the impact of his loving character even after he has left because we have so many local volunteers come up and ask us how Caleb is doing and want him to return to Liberia. We look to many more opportunities to work with you Caleb!